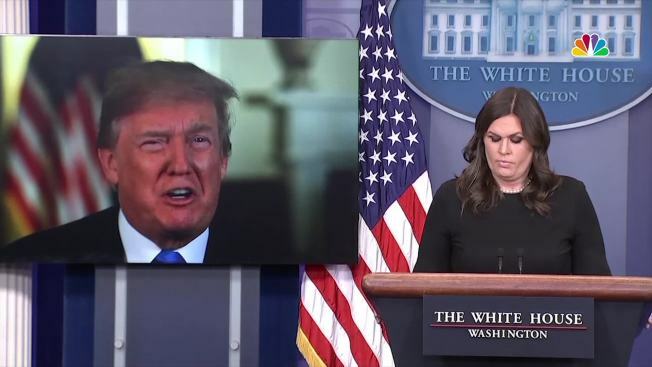 President Donald Trump spoke to reporters in the White House briefing room on Thursday, but though he was apparently just a short distance away, his face loomed over the front of the room on two video screens. The maneuver allowed him to avoid questions from reporters a day after excerpts from Michael Wolff’s scathing account of Trump’s first year in office were widely reported. Press Secretary Sarah Huckabee Sanders was left to field questions about the frequently embarrassing narrative and to denounce the book, "Fire and Fury," as full of lies and tabloid gossip. The president, who offered a statement about his tax cut bill and the bonuses companies are giving employees as a result, was reported to have been working nearby in the Oval Office at the time. Among the most explosive comments from Wolff's book was criticism from Steve Bannon, a former top Trump administration official, that Don Trump Jr.'s meeting with Russians at Trump Tower in June 2016 was "treasonous" and "unpatriotic." Trump, in turn, insulted Bannon and said he had "lost his mind." The president's lawyers are trying to stop publication of the book, which was set for Tuesday, but has now been moved up to Friday morning. Trump has already been under criticism for skipping an end-of-the-year press conference. He gave only one on his own in his first year in office, as USA Today noted last month. The White House did not immediately respond to a request for comment on why Trump did not talk to reporters in person. Thursday's video appearance quickly earned a comparison to Big Brother and other comments on Twitter. Big brother moment at the WH briefing right now. Trump on two giant TV screens literally four feet apart. When he’s done, Sanders thanks him like he’s there. These people are so weird. TUESDAY: @PressSec: Trump is "one of the most accessible presidents we've ever had." Current status: watching the president deliver a video message from the briefing room...a room that is roughly 200 paces from the Oval Office, where the president is working today. If the President wants to make an appearance in the briefing room in front of reporters he should walk in there. He's down the hall.